There is talk and writings about development of tiny drones that will be programmed to do the jobs of bees. There appears to be a link between the insecticides, herbicides, fungicides and more that are designed to match the genetically modified commodity crops and the death of bees. And Monarch butterflies, bats, fireflies, frogs and other lovely things that used to populate farms. Many growers are noticing a lack of these beauties. Silent Spring, predicted long ago by Rachel Carson, is happening in gardens all over this country. The drones in development might not be programmed to hit my garden. More important things, like the almond crop, are likely to get the drones after fees are paid. 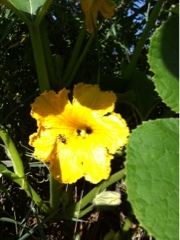 This morning we have bees in the squash. We still have honey bees, as well as bumble, squash, carpenter, swear and others I can't identify. On this hot and dry day they will all be out working, helping to make certain we have food on the farm. We will keep growing in our messy way. And planting native. Nonhybrid seeds so the bees have work to do, pollen to gather that supports them and us nutritionally, that produces honey that can keep them alive all winter. They are all over the tomatoes too. And the beans. And the clover, aster, goldenrod and more. Be careful where you step because the bees are truly everywhere on this farm.